Marley McKinney has given up her career as a paralegal in the city to run The Flip Side, a pancake house in Wildwood Cove, a beach resort on the Northwestern Pacific Coast. Sadly, she inherited the restaurant from her Uncle Jimmy who was murdered in the first book in the series, The Crepes of Wrath. Marley spent her summers growing up in Wildwood Cove and has picked up old friendships, as well as making new ones. She is also in a serious relationship with her teenage crush, Brett Collins. One person decidedly does not like Marley or anyone else in town; Ida Winkler, the town troublemaker. After several incidents of vandalism at the restaurant, prank calls and a theft, Marley goes to face down Ida in her lair, only to find her dead in a shed on the property. As the person who found the body who was involved in a dispute with her, Marley is immediately a "person of interest". Marley is justifiably worried about the effect this might have on her business and life. There is a lot going on under the placid surface of Wildwood Cove: illicit affairs, blackmail, and a meth lab operation. Marley uncovers it all, and in the process becomes the target of a dangerous and conscienceless killer. Ida knew too much and now Marley does too. For Whom the Bread Rolls has a lot of small-town charm, plenty of quirky characters and a stubbornly endearing heroine in Marley. 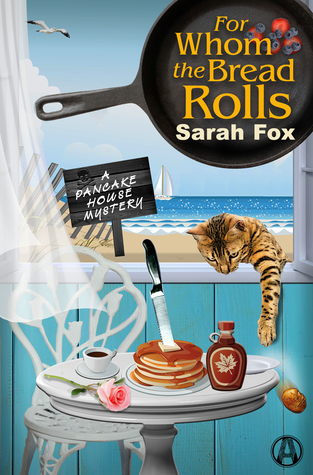 I would recommend the series to fans of "foodie" mysteries with a dash of romance. Thanks to Random House Alibi and NetGalley for an advance digital copy in return for an honest review.